The shotgun sequence reads of the TOR2 isolate are available for download. The fasta file contains 3,080 sequence reads totalling 3,621,777 base pairs. The finished genome sequence assembly, release 3, of the TOR2 isolate is available for download. The fasta file contains the first draft genome assembly totalling 29,751 base pairs. This assembly may contain errors. 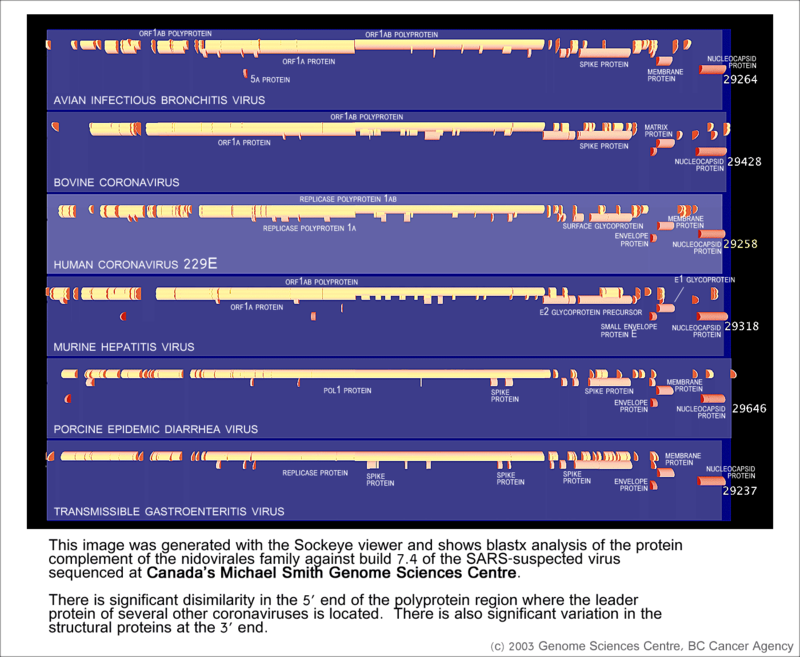 This image (zoom) was generated by the Sockeye viewer and shows blastx analysis of the protein complement of the nidovirales family against build 7.4 of the SARS-suspected virus sequenced here at the Genome Sciences Centre. There is significant disimilarity in the 5' end of the polyprotein region where the leader protein of several other Coronaviruses is located. 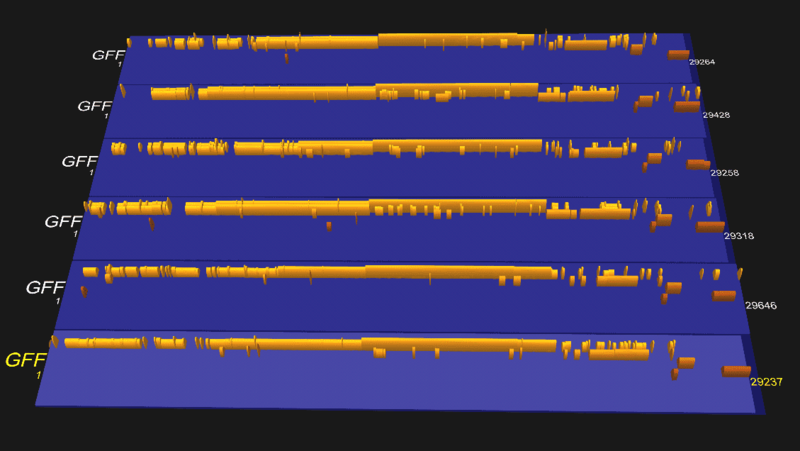 There is also significant variation in the structural proteins at the 3' end. 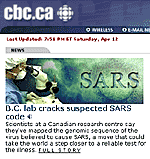 The Genome Sciences Centre SARS associated virus genome sequencing project is a collaboration with the British Columbia Centre for Disease Control and the National Microbiology Laboratory, Winnipeg. 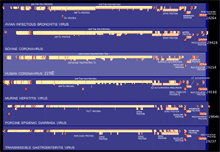 Clones derived from the SARS associated virus are now available from the SARS clone page. 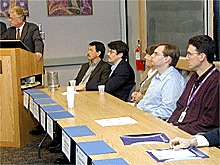 2003/04/29 | The finished whole genome assembly is available for download. The fasta file contains the finished genome totalling 29,751 base pairs. 2003/04/14 | The SARS-associated Coronavirus (TOR2) sequence has been deposited in the NCBI Genbank database under accession AY274119. 2003/04/12 | The current genome shotgun data is available for download. 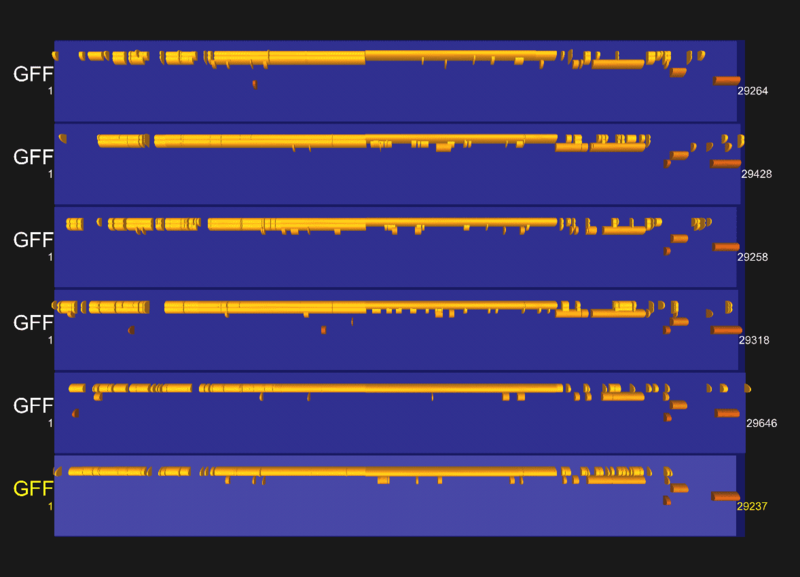 The format is raw sequence reads in fasta format, and not vector or quality clipped. 2003/04/12 | The draft whole genome assembly is no longer available for download. The fasta file contains the first draft genome assembly totalling 29,736 base pairs. This assembly may contain errors. 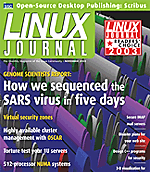 The Linux Journal features a cover article about our lab's use of Linux in the sequencing of the SARS virus. The cover of the magazine shows a 3-D image of a BLASTX comparison of the genome of the SARS Tor2 Coronavirus against the known proteins of other similar viruses. 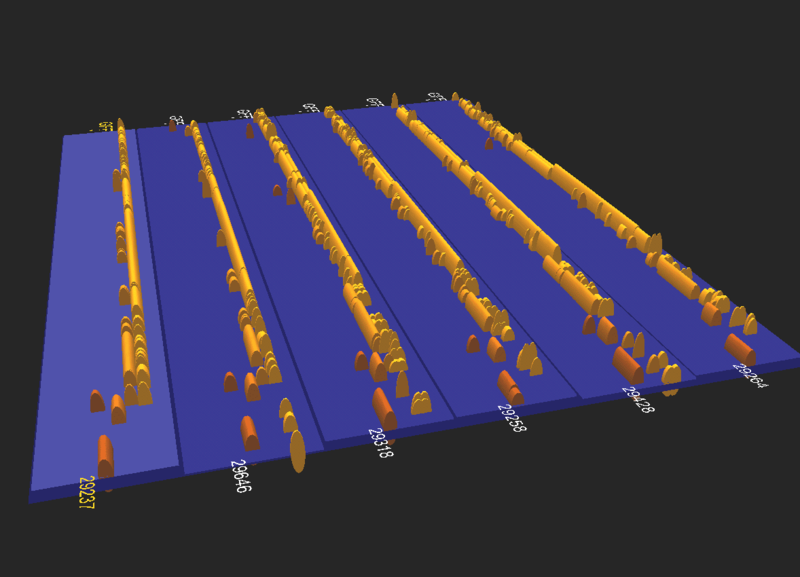 The image was generated using the Linux version of the Sockeye 3-D genome viewer, developed in our lab. 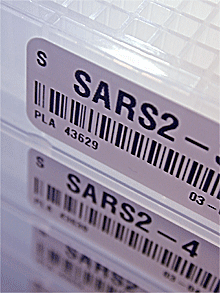 More information about SARS can be accessed here. These images were generated by the Sockeye genome viewer, developed at the Genome Sciences Centre. The images show the comparison of the sequence of the TOR2 isolate to the sequence of other related nidovirales. The tracks show blastx comparison to (1) avian infectious bronchitis virus, (2) bovine coronavirus, (3) human coronavirus 229E, (4) murine hepatitis virus, (5) porcine epidemic diarrhea virus, (6) transmissible gastroenteritis virus. An annotated image is also available. Images courtesy of the GSC bioinformatics team. The Genome Sciences Centre carries a wide range of basic and applied research in genomics, including sequencing, physical mapping, functional genomics, cancer genomics, gene expression and technology development. The photo below shows the sequencing area of the lab. 1 96- and 384-well liquid handling robotics automate preparation of sequencing reactions. 2 The lab's power and modularity requirements are unique. Network and power connections drop down from the ceiling to facilitate arrangement of instruments. 3 DNA and other samples are stored in large freezers which maintain a constant temperature of -80 degrees Celsius. 4 Thermocyclers are used to activate sequencing reactions by exposing the samples to a specific cycle of heating and cooling. 5 Robotic colony pickers are used to isolate and collect bacterial colonies which are used to amplify the DNA to be sequenced. 6 Linux-based Beowulf cluster used for data analysis and sequence assembly builds. 7 State-of-the-art robotic sequencers include the ABI 3700, ABI 3730XL, Megabace 1000 and Megabace 4000. Sequencers are loaded with multiple 96- or 384-well plates and are capable of producing over 300,000 quality base pairs from a 384-well plate per run. 8 96- and 384-head liquid handling robots used to dispense reaction liquids to multiple plates.